Part-text adventure and part-point-and-click spy thriller, Over the Alps is like 80 Days given a Wes Anderson makeover. Set in 1939, you play as a British espionage agent working to smuggle “The Watchmaker” (an old German spymaster) over the Swiss mountains and away from harm into France. But as you charm, trick and disguise yourself through Switzerland, the determined “Spycatcher” is closing in on your trail. Can you escape her clutches and bring your top secret charge to safety? 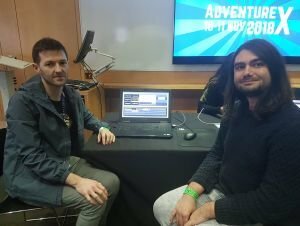 London-based Stave Studios are quite open about the inspiration they’ve taken from fellow UK company inkle, and particularly from their interactive fiction adventure 80 Days. However, in Over the Alps the team has made the formula their own in setting and style. With its backdrop on the brink of war across Europe, Lead Writer and Designer Cash DeCuir told me he hopes that this will be a political game as well as an entertaining one, following how everyday people relate to uncertain times. And whilst the game’s bright colours, quaint chalets and funiculars naturally evoke films such as The Grand Budapest Hotel, the beautiful art style also has a nostalgic feel akin to vintage travel posters and comics such as Tintin. Each location is represented by a postcard, with several red circles indicating areas in the scene the player can choose to travel to and investigate. There’s no dialogue and only context-specific sound effects: the gentle sweep of the tide at lakeside Lugano city, or the rising lilt of an accordion as you seek solace in a pub. Once you arrive at your new destination, you’ll be given different ways in which you can respond to the latest prose and dialogue offered up on-screen. Stamps act as dialogue tree choices, with names such as “Wilful”, “Charity” and “Blend” describing them. However, as with 80 Days, you are only given a brief glimpse of the first sentence of each choice, so it’s never obvious how everything might turn out. I’m told that as well as dialogue options, the player will have to decide which disguise they want to assume on their alpine adventure – tourist, aristocrat or campaigner – and stick with it, leaving lots of opportunity for replayability. In just my brief playthrough, my colleague was shot dead and I only narrowly avoided being caught by the Spycatcher, so every choice appears to have potentially major consequences. The aim is for Over the Alps to be released in 2019 on PC and iOS, and you can find out more at the official website. The idea comes from Cupboard Games, a small UK indie featuring former students from the National Film and Television School. 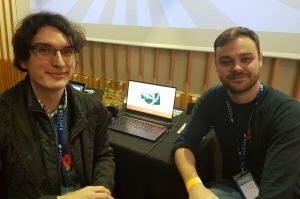 The team recently also showcased its other project, Umwelt (working title), at this year’s EGX Rezzed in the Leftfield Collection area, a first-person, “sense creation game” in which you hack your brain to solve puzzles. As it stands, Headlines is slightly less surreal but still in a similar concept stage of development. From what I was able to see, the game will be set in a bright, cartoon-like world made up of 3D anthropomorphic animals, with the player starring as an intrepid journalist badger named Honey. In the playable segment on offer at the conference, I had to edit a show reel to showcase my journalistic flair to potential employers using a faux Final Cut Pro-style programme to drag and cut clips. Developers Paul Dillon and Jon Hatton told me they hope to use this mechanic further to explore the idea of media manipulation. For example, at some points in the game your boss may want you to cut news footage a certain way that might not be completely truthful to the actual event. It will be up to you to decide how much you compromise to get ahead, or hold fast to your journalistic integrity. Headlines currently doesn’t have a release date, but you can follow its progress on Twitter at @CupboardGames. In Blood Money, a near-300,000-word interactive novel by writer Hannah Powell-Smith, you play as a ghost whisperer for the mob (because being a mere mob member alone just doesn’t cut it these days). When the city’s most notorious crime boss – your mother – is murdered, the criminal underworld is thrown into disarray. It’s up to you to decide the fate of the family business, whether that means letting your sisters Fuschia and Octavia fight for control, taking the top spot for yourself, or even selling out your own siblings to work for a rival gang. I played the first chapter of this rich text adventure, which does away with any sound effects or graphics, focusing solely on eloquent and sometimes lengthy paragraphs of black print on a plain white page, to allow the player’s imagination to paint the world for themselves. I was usually offered between 2-5 choices of dialogue or action for each situation, ranging from telling lies to searching hidden compartments for clues or slipping unseen into prison guard compartments. Naturally, being a child of the most famous crime boss in the city, some of the options are relatively violent too, though how you conduct yourself in the early stages may well come back to haunt you – quite literally because of your ability to talk to ghosts! Whilst I only got to interview one ghost in the demo (my mother’s! ), it seems this is a skill that will come into play in navigating the seedy underbelly of the mob scene a lot more in later chapters. As well as choosing how to react to various family squabbles and dark goings-on, I was also given the choice of determining my character’s name, sexual orientation and gender, amongst other personal touches. This is done in a pleasingly subtle way (for example, sexuality is chosen by how you openly respond to a passing flirtatious gondola rider). By the time I’d found the culprit behind my mother’s murder and broken into their prison cell to seek my revenge, I had already created a relatively defined and complex character for myself through just a few clicks. Blood Money has already been released on PC, iOS and Android. You can find purchase links and more about the game through its official website. 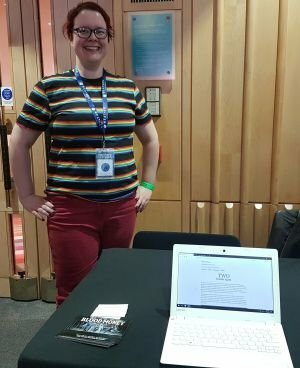 Hannah also told me she is currently working on Crème de la Crème, another text adventure about restoring your family’s reputation, but this time by attending a finishing school in Switzerland. She hopes to release it in the spring or summer of 2019.